What's on your menu this week? I always like seeing everyone's meal plans. I'm in a group text with several girls (many who are or were Charlotte bloggers you may follow!) and we're constantly chatting. A topic of conversations most Sundays is what is on everyone's menu for the week. It's a great way to get ideas! Sunday night we went easy and light since we'd had a big weekend in the mountains of "splurgey" food -- barbecue, burgers, Mexican food. 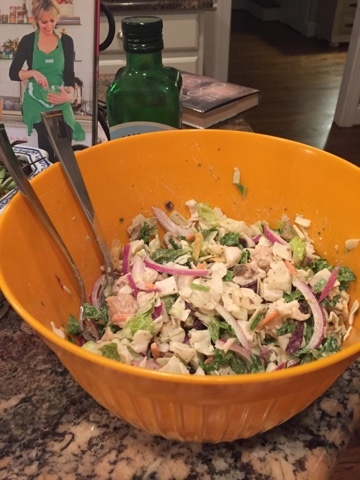 I bought a bagged chopped salad from Harris Teeter (it was on sale for $3) and added in pre-cooked chicken slices from the freezer section and some sliced red onion. Done. That pre-cooked chicken is also awesome for toddler meals. 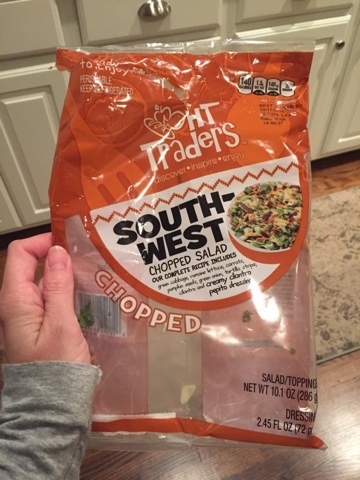 The chopped salad has cilantro in it and a cilantro pepita dressing which is delicious. Here's what the bag looks like for any of you local readers who shop at HT! So, dish -- what's on your menu this week? Love these types of posts! I have beef in the crockpot right now for beef and noodles. Stew meat, onion powder, beef broth and pepper cooked on low for 8 hours, then move to the stovetop, add in reames egg noodles and cook until noodles are done. Super easy and delicious! Putting that white bean salad and lemony chicken on our menu for next week. Yum! I love it when blog friends share their meal plans . . . it makes it so easy to just try those ideas too! Thank you! I love these posts! That cheesy cauliflower bake - yummy. 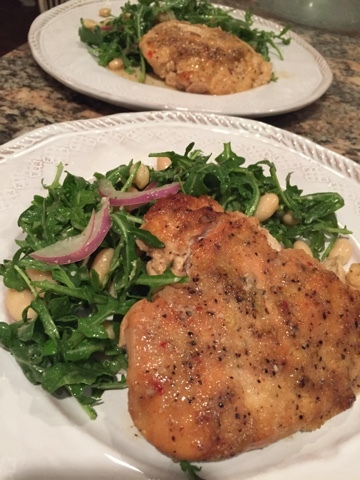 Lemon chicken and that salad is happening tonight at our house! Thank you! We have a few standard meals that our kids love and are in heavy rotation, one of those is these super simple pulled pork tacos (http://heylittlemomma.blogspot.com/2016/10/taco-monday.html). What brand of frozen chicken slices do you buy? I never go into the store anymore since I do pick up and I want to buy the right one online. Thanks! Our menu this week is pumpkin chili, salmon with green bean casserole (I usually serve this with your mashed cauliflower once a week but I had these ingredients on hand), and chicken pot pie. With the cold weather I'm loving anything warm and that makes leftovers :) Thanks for sharing your weekly meals, I always love your recipes! I just posted a similar theme on the blog today - we recently did meatloaf cups with mashed potato icing (great for portion control), a fab white bean chicken chili soup in the slow cooker and then stuffed peppers carved to look like little pumpkins that miss A loved! I'm definitely trying your ribs by the way! Yum! I posted one yesterday too! 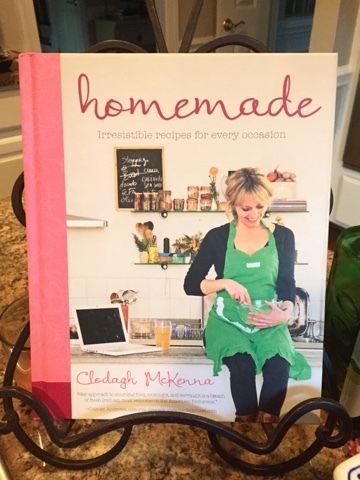 Complete with recipes!